Build a thriving civilization - in under an hour! In Roll Through The Ages, The Bronze Age players collect goods, assign workers to build cities and erect monuments, advance your civilization through cultural and scientific developments, but don't forget to harvest enough food to feed your growing population. 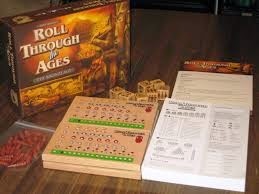 Grab those dice and Roll Through The Ages in this fast paced, addictive and strategic game. Dice with special symbols for food, resources, money and the not-so-good skull and crossbones are included. 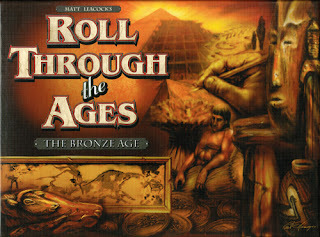 Roll the dice as many as three times, track resources on a handy pegboard and complete monuments before your opponents. When all five monuments are completed the game ends.